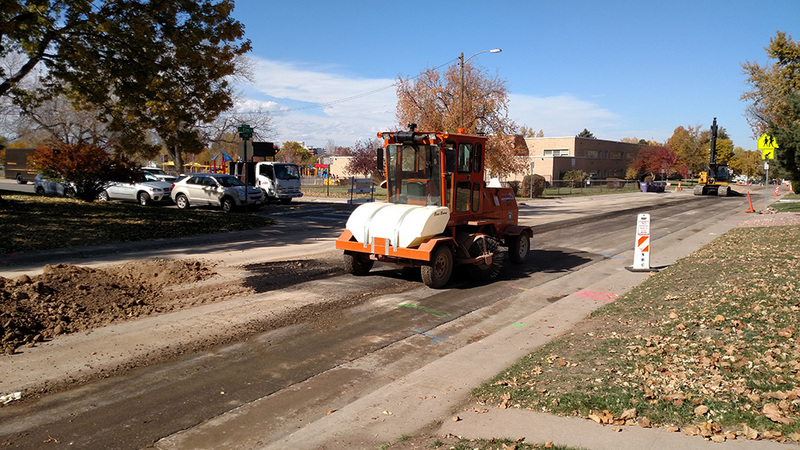 Denver Water replaces water mains for various reasons, including repairing or avoiding main breaks, replacing corroded pipe, alleviating water quality problems, increasing available hydrant flow and improving area delivery. *If you want to view the larger map or the map isn’t loading properly please launch project map in new window. The water distribution system contains more than 3,000 miles of water mains, and Denver Water crews install or replace an average of 60,000 feet of pipe a year. Replacements are done for various reasons, including repairing or avoiding main breaks, replacing corroded pipe, alleviating water quality problems, increasing available hydrant flow and improving area delivery. All of these are important to maintaining the system that delivers your water. Denver Water crews are in the second year of replacing about 60,000 feet of pipe through a targeted 12-mile zone in west Centennial where 18 water main breaks occurred over a two-year span — more than three times the number of breaks as the rest of Denver Water’s service area. 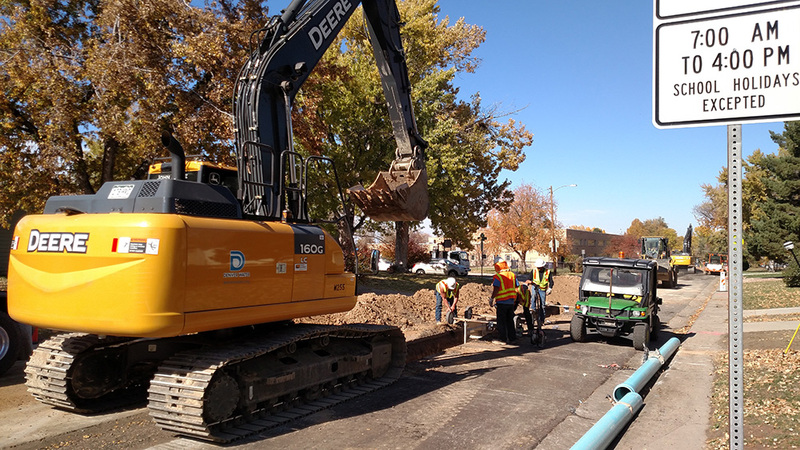 Read “Looking for ‘hot spots’ — in all the right places” to learn more about Denver Water’s approach to replacing water mains. When Denver Water is working in your neighborhood, you will receive notification with project details and contact information. Every improvement and replacement project is different because of the conditions at the project site, but there are similar activities you can expect to see during each phase. Two weeks before Denver Water begins setting up for the project, the crews will go door to door in the impacted area to hand out letters with information about the project and answer customer questions or concerns about the upcoming work. Take photos and video of the street, sidewalk and the front of the property so we can restore all to pre-construction condition once the project ends. 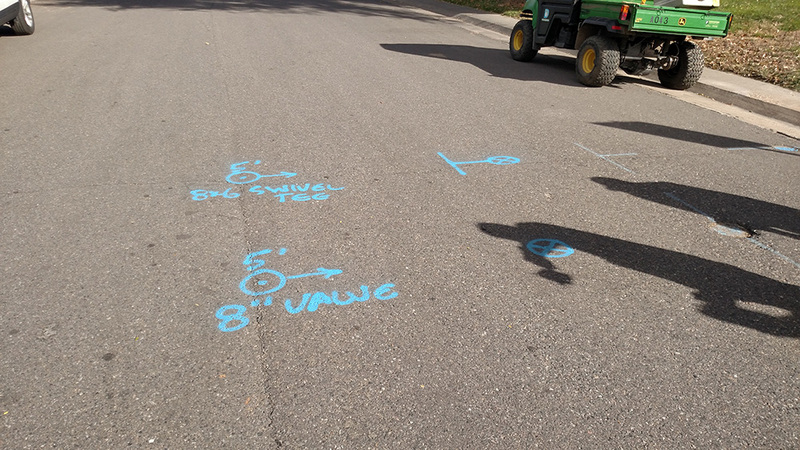 Survey and use temporary blue paint or stakes to mark the alignment of water services. Place NO PARKING signs along the project path. Street parking will not be available during working hours for the duration of the project on your street. Parking will reopen every day after work hours to allow for overnight parking. Store equipment and material along the project route and along adjoining side streets. This material includes the new water pipes and orange stormwater management devices that will collect sediment flowing toward stormwater drains. Customers will also notice a project headquarters trailer parked nearby for project personnel. When the work day begins the street will be barricaded and closed to through traffic. Special arrangements will be made to allow homeowners in and out of their properties. 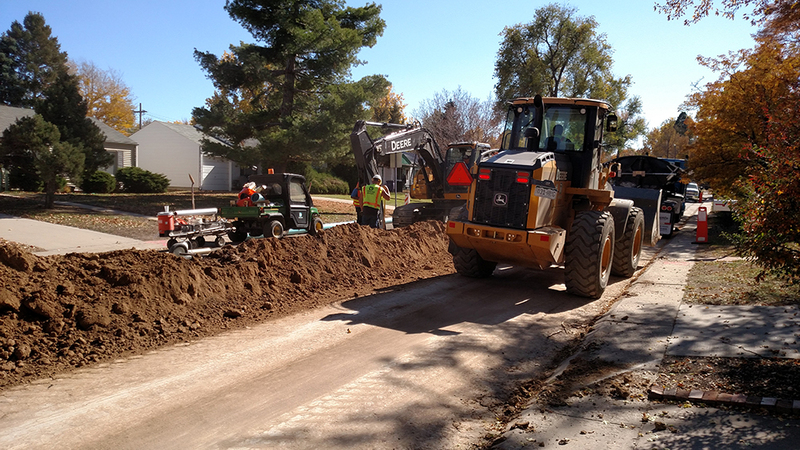 At the end of the work day the street will be swept and the trench will be covered with a temporary patch. Overnight parking will be available. During trash days, all waste management vehicles will be allowed access to the project area for scheduled trash pickup. The crew will rotomill and saw-cut the street. They will then use heavy equipment to install the new water main. The pipe crew typically needs three to five days to install a new pipeline along a street, between intersections. Crews will keep dust to a minimum. Water main replacement projects typically last one to two months throughout a targeted area. Projects can last longer for a variety of reasons. All residents will receive notice 24 hours in advance of planned water outages. This will give the homeowner time to plan for the outage occurring the next day. Once the new water main is installed the crew will pressure test the pipe to make sure there are no leaks. Denver Water’s lab will test the water in the new pipeline to verify it is safe to drink before putting it into service. During testing, water will run through the pipe and into the storm sewer for several hours to clear all debris from the new main. Although all efforts are made to ensure the new main is free from sediment, you may notice a reddish discoloration in your water caused by non-hazardous sediment that has entered the main. If this happens, run cold water for a few minutes from the outside hose faucet or the lowest point in your home, and clean aerators from all faucets in your home. Dirt or debris can enter water lines for any number of reasons when field crews need to shut down water service to customers while performing ordinary water system operations, including replacing or repairing water pipes, hydrants and valves. Dirt or debris can sometimes damage water-using appliances. To prevent damage, you may want to disconnect or turn off ice makers, washing machines, dishwashers, sprinkler systems and filtration systems before Denver Water shuts off water service. Denver Water is not responsible or liable for damage to your property resulting from pressure changes or stoppage of the flow of water to your home. After Denver Water’s lab confirms the water is safe to drink, the crew will begin connecting homes to the new water main. This requires a brief water outage and each homeowner will receive a knock at the door notifying them that their water will be shut off and an approximate time for when it will be turned back on. Crews will flush the outside spigot of your property following a service line connection. After the water main replacement project is complete for your property, we recommend you run one of your cold water taps for one to two minutes to displace the standing water in your service line before consuming the water. After all water services are connected the pipe crew will begin replacing the fire hydrants along the street. This will require the crew to excavate in the yards that have a hydrant on their property. Any landscaping and or sod that is damaged will be scheduled to be repaired and or replaced by Denver Water’s contractor. The last step of the pipe installation requires the construction crew to connect the new main to other water mains in the side streets. This work will typically take place in an intersection. Homeowners who will be affected by a water shut off will be notified 24 hours in advance in order for them to make arrangements for their water needs the next day. 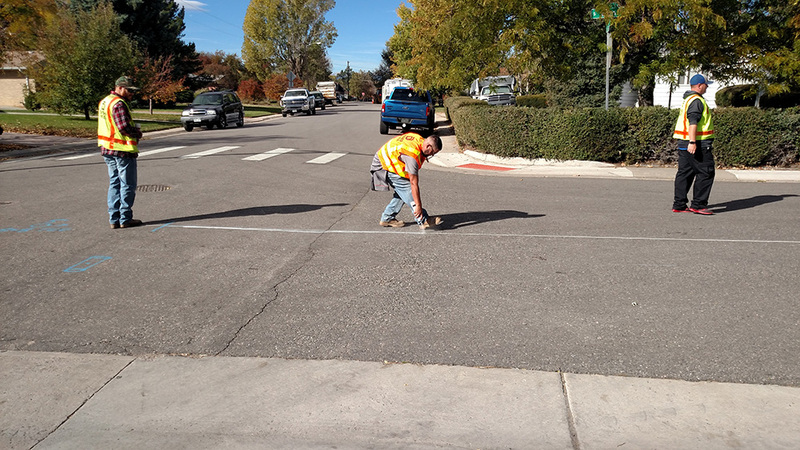 Denver Water cares about public health and will replace any customer-owned lead service line discovered during the project with a copper line. Note: If a homeowner has a lead service line, a Denver Water representative will contact them and schedule a time to have the entire line replaced. Someone must be home during the replacement to provide access to the water connection inside the home. Because lead service line replacements can temporarily elevate lead levels in water to that property, we will provide post-replacement instructions, a water pitcher filter and filter cartridges to protect residents’ health. Note: If your neighborhood has lead service lines, the water main replacement project will take much longer, because of the added time required to complete each individual lead service line replacement. This one-time disruption will bring a lasting public health benefit to your neighborhood. Any landscaping or sod that is damaged will be scheduled for repair or replacement by a Denver Water contractor. Once water is flowing and the project is completed the crew will do a final sweep to clean the area and begin moving all equipment and material out. 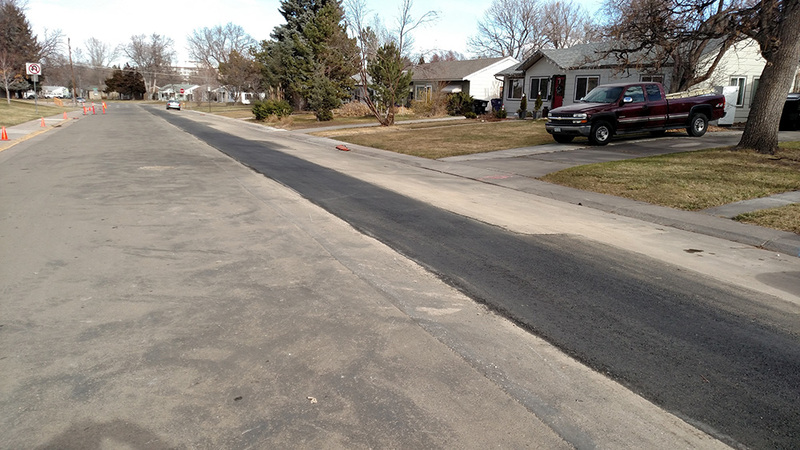 Our contractor will install a permanent asphalt patch within a month after project completion, weather permitting. Street signs and stormwater management devices will remain on site to collect sediment until the street is paved and sod is restored. This could mean the stormwater management devices will remain positioned in front of storm drains for several months. Denver Water’s contractor will provide a one-time restoration of landscape to its pre-construction condition, at no cost to you, in the fall or spring when temperatures are suitable for planting. Customers are responsible for watering and caring for these plantings. If weather conditions are not suitable for sod replacement, we will use straw on your landscape for erosion control until conditions improve. All customers are placed on a landscape list in the order their water main replacement project occurred. Note: Customers may have to wait several months until it is their turn on the project list and weather conditions are suitable for planting. Thank you letter mailed to you upon project completion. Tip: Click pictures to see captions. To inquire about a specific project, call Denver Water Customer Care at 303-893-2444.